Microsoft unveiled the new version of the company's Office suite Microsoft Office 2019 today. The new Office 2019 will be released for Windows 10 (and newest LTSC of Windows Server) and Apple Mac OS X (most recent version according to Microsoft) only. Commercial volume license customers may access Office 2019 starting today while all other customers, home users and businesses alike, will be able to buy and install the new version of Office in the "next few weeks". Office 2019 is the new on-premises version of the Office suite that includes updates to Word, Excel, Outlook, PowerPoint, Publisher, Visio, Access and Project (the last four are only available for Windows). Office Server products, Exchange Server 2019, Skype for Business Server 2019, SharePoint Server 2019, and Project Server 2019, will also be released in the coming weeks. Word 2019: Black theme, learning tools, text-to-speech feature, improved inking support, accessibility improvements. 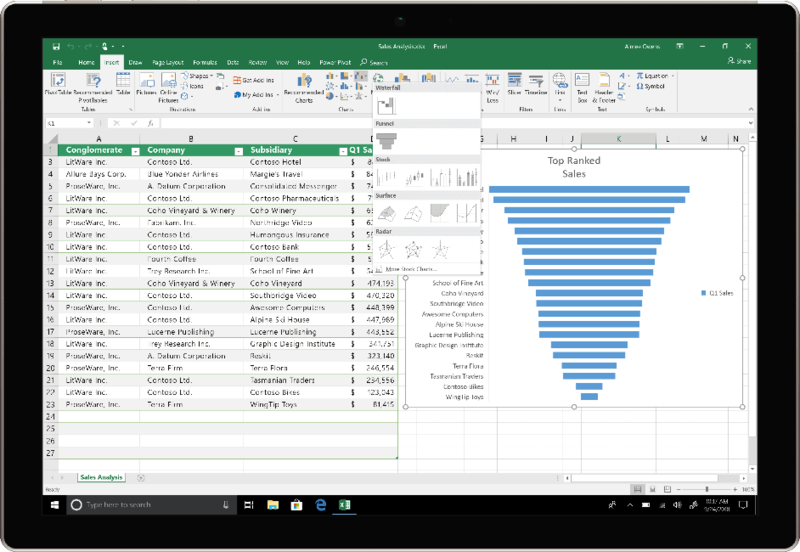 Excel 2019: funnel charts, 2D maps, timelines, new Excel functions and connectors, publish Excel to PowerBI, PowerPivot and PowerQuery enhancements. PowerPoint 2019: Morph transition feature, zoom capabilities to order slides within presentations, insert and manage icons, SVG and 3D models, improved roaming pencil case. Outlook 2019: Office 365 Groups support (with Exchange online account), focused inbox, travel and delivery summary cards, updated contact cards, and @mentions. Editor and Researcher in Word. Tap in Word, PowerPoint, and Outlook. Ideas and Data Types in Excel. Real-time collaboration across Word, Excel and PowerPoint and @mentions. Sensitive Label support in Word, Excel, PowerPoint and Outlook. Microsoft revealed today that Office 2019 won't be the last on-premises version of Office; this means that the company will release another version of Office that is not cloud-based. Microsoft introduces the click-to-run installer with Office 2013. Users and administrators could install Office 2013 and 2016 using the click-to-run installer or the MSI installer. With Office 2019, we’re moving the on-premises versions of Office to C2R to reduce costs and improve security. The advantages of C2R include predictable monthly security updates, up-to-date apps on installation, reduced network consumption through Windows 10 download optimization technology, and an easy upgrade path to Office 365 ProPlus. Office 2019 supports only click-to-run installations. One of the main issues that admins and users may face is that the click-to-run installer installs all Office apps during installation. No problem if you plan to use them all but what if you don't need some of the apps? The solution comes in form of the Office Deployment Tool that you can download from the Microsoft website. It is a command line tool to deploy click-to-run versions of Microsoft Office. Office 2019 is available for a one-time payment. In other words: there is no subscription. Downside to this is that Microsoft decided to limit updates to security and quality updates. The company states that Office 2019 won't receive new features after its release. Office 2019 is a perpetually-licensed product similar to previous major versions. It will receive regular security updates but no new features after its release. That's different from Office 365 ProPlus and other subscription-based products. There is no requirement to upgrade an earlier supported version of Office to the new Office 2019. Office 2013 and 2016 continue to be supported. Office 2019 does not require an active Internet connection, or Internet at all, when it is installed. The product is fully installed on the system and can be used without active Internet connection because of that. Updates are made available on the Internet but they can be "hosted on-premises for disconnected networks". Microsoft revealed that Office 2019 includes five years of mainstream support and two years of extended support. The company notes that this is an exception to the 10-year fixed lifetime policy term and that seven years of support aligns it with the end of extended support for Office 2016. Office 2016 and Office 2019 can't be run concurrently on the same operating system. Microsoft unveiled the new version of the company's Office suite Microsoft Office 2019 today for Windows 10, Mac OS X, and Windows Server. Since after Office XP it has been a downward spiral….that’s why i changed to Libre Office. It has worked for my needs, and still does. Wouldn’t touch it today ! Considering nothing has been changed since Office 2010, this is hardly an issue. Office 2013 and 2016 also have horrible font rendering with grayscale antialiasing instead of RGB one, which makes things difficult to read. If O2019 has this issue too, which it probably does, then they can keep it. Btw, support for this thing expires the same date as support for O2016, in 2025. Turns out Office 2019 installs and works fine on Windows 7. All Microsoft did was to not allow the installer to run on Windows 7/8 by default and there are workarounds for this. Do tell the details or post a link, will ya, pretty please with sugar on it? You must create an account to see all posts. Read 17 pages for that? Can you link to the appropriate post? Probably some people are in silence right now to don’t disturb your love with W10. You’re like one of those people that think if we don’t like Hillary Clinton we are automatically Trump “fans”. The biggest haters of Windows are the ones that have been using it since 1.0 and are well aware of all of Microsoft’s anti-consumer schemes. This comment here, is 100000% bang on the money!!! Absolutely how it is. There has been a lot of Microsoft-bashing going on from day one (by Microsoft users, I mean), and for good reasons. However, there was a long period of time where they were greedy monopolists (and sprang to success stealing IBM’s property), but were praised for their products. Now they are just greedy monopolists. Windows 10 and Office 2019, an OS claiming to be the most secure with as exclusivity a suite making your computer look like a Christmas tree especially targeted by hackers. Good luck with that. I like it doesn’t require internet access after activation. I didn’t expect that in this version. I haven’t used newer Office since 2010 so I don’t know. I always thought 2010 was the ugliest of them all, so I never bought an official licence. In hindsight, there are some regrets. I don’t know. In my opinion, every release of Office after 2008 or so is not really worthwhile anyway. I have taken to reading just-published Office how-to’s on various tech sites. Most tips work on my 2003 edition. Needless to say, none of those writers bother to check their articles for compatibility with such an old and unsupported version. On top of that, it seems you now need a PhD in software marketing just in order to understand whether the last edition of Office is right for you. And you’ve got to love all those mean little exclusions, for a program which, after all, is hugely expensive, as far as mass-market software is concerned. Plenty of much smaller software publishers either price their products much lower, or have much more lenient usage and licencing rules (sometimes both). Microsoft keeps asking hefty prices for programs whose groundwork was laid down decades ago, and they enforce drastic conditions, which they keep making worse. That’s not mentioning, er, the top-notch reliability of “updates”. Each time we’re gifted with a new edition, it seems a great chunk of the “improvements” are for the benefit of Microsoft only : either you can’t use your Office edition if you don’t surrender to the cloud, or you don’t get updates apart from security ones, etc. Don’t you really love Microsoft as a company ? Aren’t you eager to buy their new products ? You say the Office 2003 interface is outdated. I say it’s classic. The ribbon never struck me as “better”. Your wording is more polite than mine. However, even this late-adopter (and often never-adopter) of new technologies finds the baby blue + orange-yellow combination of his Office 2003, well, ridiculous. I find the ribbon concept useful in programs with much fewer functions than Office : have a look at Phrase Express, for instance. There’s a very powerful free version (and the program is good if you need that sort of thing). I agree. The ribbon presents serious usability problems that never fail to make me curse. Office 2003 is still the best. It does everything 99% of users will ever need and the ‘clunky’ interface allows much more customisation for power users than anything possible with the retarded ‘ribbon’. I’m always curious to hear from people who have experience both of Office 2003 and later versions, since I’ve never upgraded. What editions have you used ? Has there really been so little progress ? Word would be my main area of interest, altough I use Excel and Outlook as well. I know that Microsoft severely reduced the interface customisation possibilities when they switched to the ribbon, but haven’t they corrected somewhat their mistake since ? Adjusting the interface to your needs was indeed one of the great assets of Office, up to the 2003 edition. I’ve been using every version of Word since well before 2003, and I agree with John Bayley that 2003 is the best one that has been produced. The versions after that don’t really add much that is useful in terms of features or improvements, and include UI changes that I think have been for the worse in terms of usability. Yes, I really didn’t want to move from 2003, but finally accepted my fate, and moved to 2007. That does everything you could ever want, so I just can’t ever see me moving from it. You can’t keep reinventing the wheel. You don’t keep changing your telly or PVR after all. There comes a point where something just does the job it was intended to, and you hardly need anything else after that. Sigh. I still don’t see any tabs. Will have to stay with Office Tab indefinitely, I guess. @Reggie: just for clarity: Office Tab is not free, as it purports to be. Other than that, MS Office should have offered that as a standard feature a long time ago. M$ Office is STILL inferior to WordPerfect. At every worksite I had a job, I showed the bosses WordPerfect and they converted, never went back to M$ Office. Now Microcrap is cutting their own throats by refusing to make MO2019 work with Windows 7, a still-supported version of their own OS. Good I say. haha! I used to work for Wordperfect in the late 1980s!! Fancy you mentioning them. Another step towards ditching home users as customers. With Office there is no problem because there is LibreOffice. Here goes my usual rant : Libre Office is no replacement for Microsoft Office, first of all because it does not have the Plan Mode Microsoft Word has, and no other Windows word processor offers — except WPS Office (freemium), which mimics it suprisingly well, but has very shady practices relative to in-app ad placement and exfiltrating your personal data (to China, probably). Then because it has awful icons, which scale very badly in some DPI configurations. Other people who’ve used it much more than myself complain about imperfect compatibility of formats, macros being not good enough and possibly other things. Oh, and its database component is no match for Access. @Clairvaux: I can’t judge LibreOffice prperly because I have not used it much. From my point of view the only thing I would have against it now is that its Excel equivalent does not offer the Tables feature, which I use extensively in Office 2013. At the end of the day, though, it all depends on people’s individual use cases and what works best for them. LO is undoubtedly not perfect, neither is MSO. If someone would want/need to ditch MSO, then LO is 1 possibility. I tried WPS Office and liked it a lot, but it does not have a OneNote equivalent, which I use extensively too, although I am trying to extricate myself from it. Another issue that people may have with WPS, though I don’t have that problem, is that it is a Chinese suite. To me, whether it is Chinese, American, Russian, or whatever else, does not make a difference, like it does not for Opera. But many people take issue with it. Anyway, LO is 1 possibility, probably the best known, as an alternative for MSO, but there is more out there. My point was: MS is helping people out the door. I’ve been using both for a very long time now, and I have to say that I haven’t found LibreOffice deficient at all (but then, I’d never even heard of Plan View, let alone used it, so that might be a functional difference). What is true is that the method of working is very different between LibreOffice and Microsoft Office. While I haven’t found anything that MS Office can do that LibreOffice can’t, knowing how its done in MS Office often doesn’t help you in terms of doing the same thing in Libre. As to which method of working is better, I’d say “neither”. As with so many things, the one that is “better” is the one you’re more used to. Mode Plan (French) = Outline View (English). And yeah, I *do* miss Word’s outlining feature in LibreOffice Writer. But I have to say, the several times I’ve used it in Word 2010 (and maybe Word 2016 — I forget), on other people’s computers, it sure seemed to be a lot less intuitive than it used to be. I suppose I’d just need to spend more time getting familiar with the new controls. Also, yes, LibreOffice’s macro documentation is split across OpenOffice and LibreOffice sources (or it *was*, last I checked), and you really need to have at least *some* coding skills if you want to be able to write macros from scratch. (Isn’t this also true for MS Office macros since ca. 2000?) However, despite being a complete coding ignoramus, I’ve been able to *record* macros in LibreOffice and then, through educated guesswork and trial and error, hack them enough to do at least *some* of what I need. With 80s and 90s versions of Word and Excel, which used relatively straightforward macro languages, I was able to able to figure out how to use If and While loops and generate dialog boxes and set variables, and more, all by my ignorant self. With LibreOffice and modern versions of MS Office, it seems like there’s just too much basic programming knowledge you have to master first. On the plus side, it’s widely known that LibreOffice recovers corrupted or old-format MS Office files more reliably than modern MS Office suites do. I’ve used it for that myself a couple of times. Also, some of us prefer an old-school menu-driven interface to the Ribbon. If you’ve ever used a menu-driven interface, you know how to use LibreOffice’s. Not so with MS Office’s Ribbon. (I’ve always found it interesting that when Microsoft first introduced the Ribbon, they released an hour-and-a-half-long video and seven *really long* blog entries to explain just how intuitive, easy, and generally fabulous it is!) The LibreOffice team has been developing its own answer to the Ribbon (the “Notebook bar”) for maybe a year or two, but it was pretty primitive when I tried it (immediately after its public unveiling) and I’m not really motivated to return for a second look, even if it’s much improved. LibreOffice is *easily* sophisticated, stable, and bug-free enough for what I do now. Its quality, features, and compatibility are continually improving, and I can install it and use it for as long as I want, on as many computers as I want, running whatever operating system I want — without worrying about licensing and telemetry. I have deliberately avoided using Outlook for personal use from early on (to avoid vendor lock-in); I don’t need a database app; I don’t do PowerPoint; and I don’t *currently* need any of Word’s or Excel’s exclusive bells and whistles. Besides, I’m going to be moving to Linux very soon, and I’d rather use a native office suite than try to run MS Office in Wine, Crossover, or VirtualBox. Still, I’m glad to have learned what a “funnel chart” is. ;-) And more seriously, it’s nice that Microsoft is still offering a non-cloud version. Super-greedy M$ crippling Office 2019, in order to push “trapped” users onto Office 365 subscriptions and Win 10. Time for a technology revolution against evil M$, Office 365 and Win 10.? Remember the good old days of a fairer M$, Office 2003/2007 and Win XP/7.? Doesn’t look that special to me, and the screenshots look just like Office 2016. To be honest, I would trade future “feature” improvements if only MS could make Office 2016 so that it works reliably, quickly and without crashing once or twice a day. I do generally like Office 2016, but blimey is it slow and buggy! One thing that is remarkable with Office 2003 is the sheer speed it launches with, despite its huge size and innumerable features. MIcrosoft certainly used its knowledge of Windows to bake in some tricks to that effect. Many modern programs are lazy sloths compared to that. What is the point if there are hardly any improvements worth paying for? Up until Office 2013, there were still some considerable improvements and even the addition of “Tell Me” search in 2016 was good but after that, nothing of significant use or value has been added. 2013-2016 is full of annoyances like tasks taking too many clicks to get done via Backstage view, bad DirectWrite text rendering, disappearing scrollbars. The one program everyone begged them to keep in Office 2019 was OneNote but like the extremely boneheaded occasional decisions they take, they retired the Win32 app and kept the UWP app killing its usefulness and joy for me. Where does it say that Office 2019 is available for a one-time payment, in other words no subscription? It does not say so in the official press release from Microsoft. So where did you get this information, Martin? Office 2019 probably won’t work on LTSB/C edition because M$ don’t want everyone using LTSB edition. I looked for the price on Microsoft site and did not find it. How-to Geek says it’s $ 249. That’s extortionate, given the restrictions. New Office is Ugly. There are no other words for it.